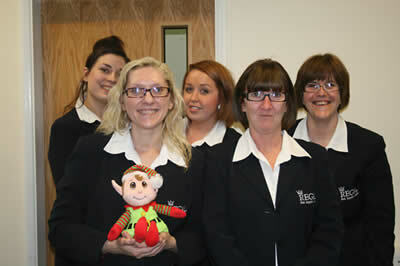 Here he is having his final pic with the lovely ladies in our Admin department. Lisa loved her new bracelet! Here they are at their desks, please with their gifts! 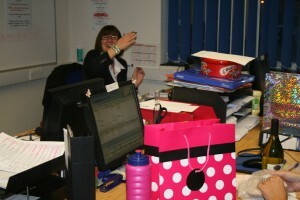 In case you are wondering it was some begian chocolates! 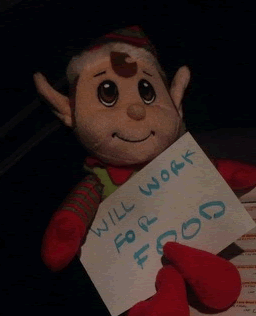 There aren’t many left now. 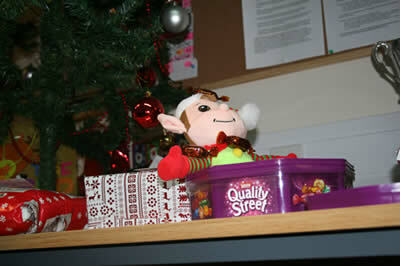 Welcome back to head office Elfis! 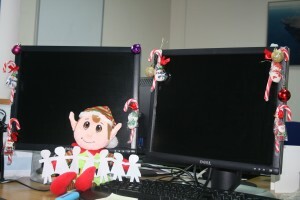 Elfis arrived back at our head office this morning. 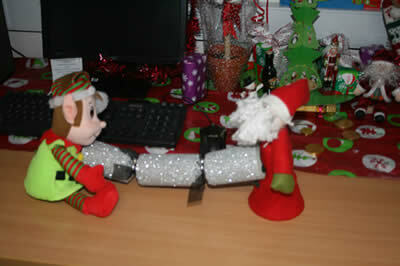 Sue didn’t believe he had turned over a new leaf and sensed he had more mischief up his sleeve. Just to be sure, she set him some lines! 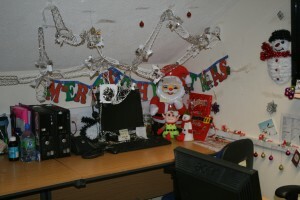 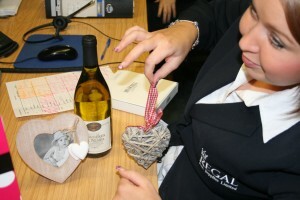 Once he finished he decided he would surprise some of the lovely staff here at Regal by making their desks look a little more festive! 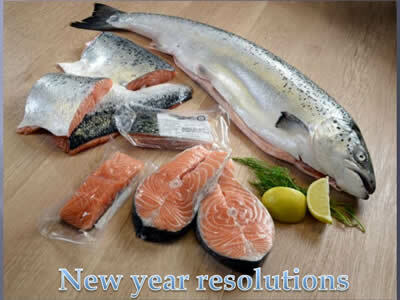 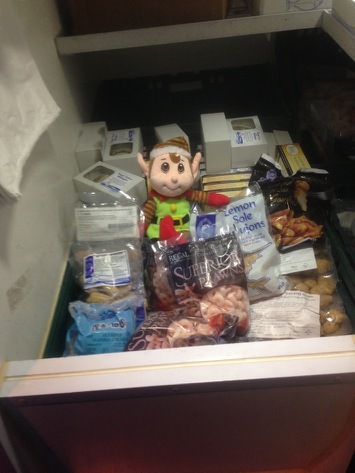 Before Ian (our Factory Supervisor) had chance to set him to work in the cold store. 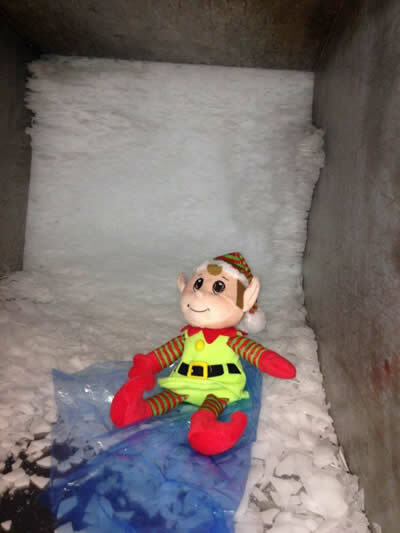 Elfis managed to find an ice bin and we didn’t get much else out of him for the rest of the morning! 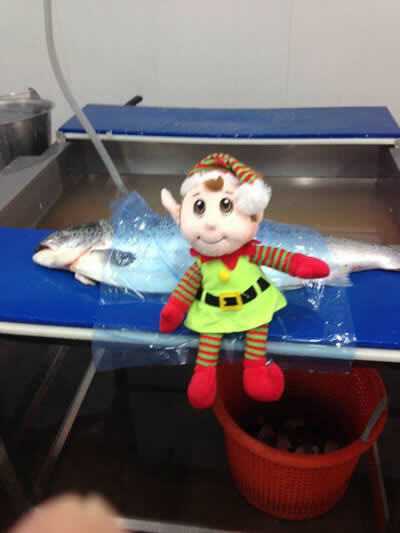 Lee brought Elfis back to Grimsby this morning. 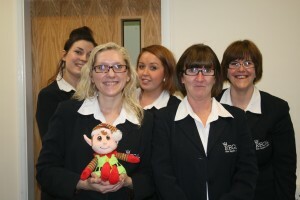 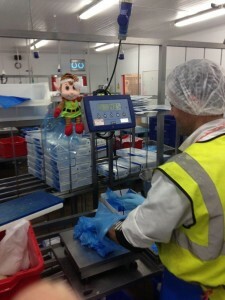 He wasn’t to keen to let him go but Elfis was very excited to meet the lovely staff in the Factory! 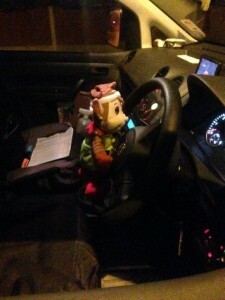 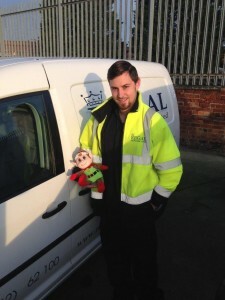 Elfis enjoyed his first day as a delivery driver! Lee enjoyed Elfis’ company, but he wasn’t willing to share his pack-up with him! 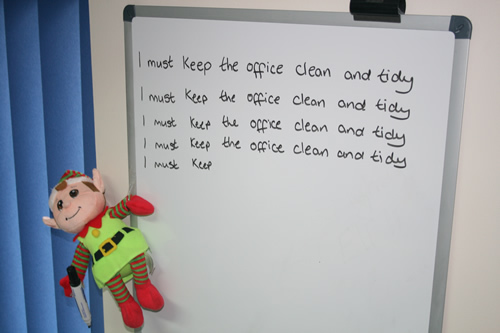 You tell him Sue!! 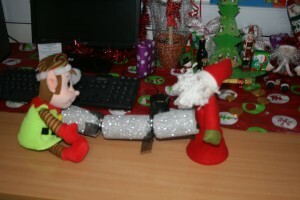 Elfis gets a telling off by the cleaner… again! After Elfis’ antics in the Call Centre, this is how we last saw him. 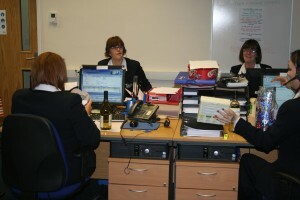 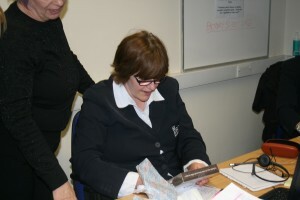 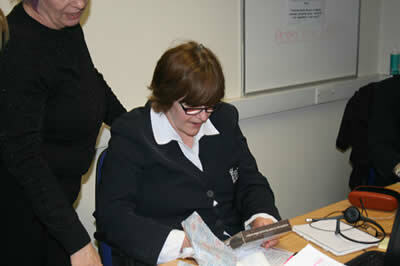 Pictured here getting a good telling off from Sue again! So that she could enjoy her last week before the Christmas break, she packed him off with Lee, one of our delivery drivers at the weekend. Elfis’ Christmas party in the call centre! 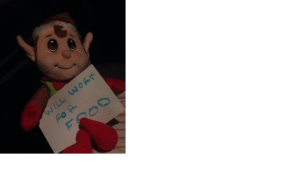 Looks as though someone had a late night! 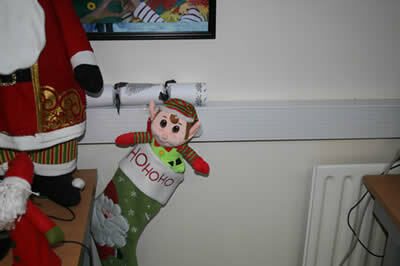 More hide and seek fun! He must have tired himself out, this is how we found him this morning! 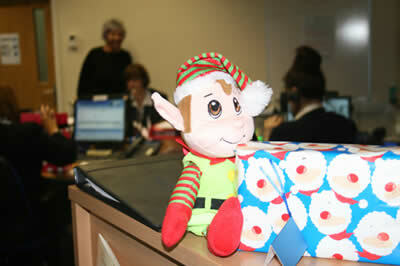 Elfis had fun in the call centre! 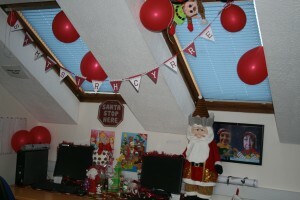 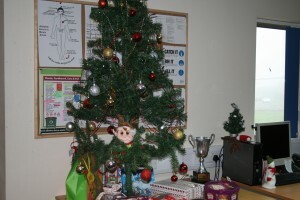 Looks like Elfis enjoyed his own little office party in the Call Centre last night! He’s made himself comfortable on one of the desks!